The mission of ThunderSVM is to help users easily and efficiently apply SVMs to solve problems. 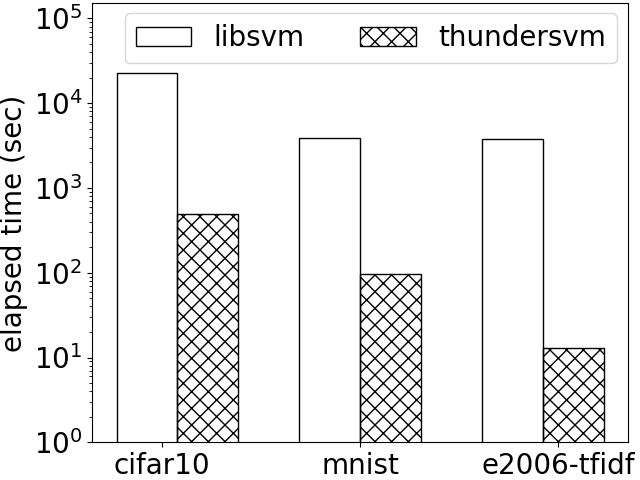 ThunderSVM exploits GPUs and multi-core CPUs to achieve high efficiency. Key features of ThunderSVM are as follows. Support all functionalities of LibSVM such as one-class SVMs, SVC, SVR and probabilistic SVMs. Use same command line options as LibSVM. Support Python, R and Matlab interfaces. Supported Operating Systems: Linux, Windows and MacOS. Why accelerate SVMs: A survey conducted by Kaggle in 2017 shows that 26% of the data mining and machine learning practitioners are users of SVMs.